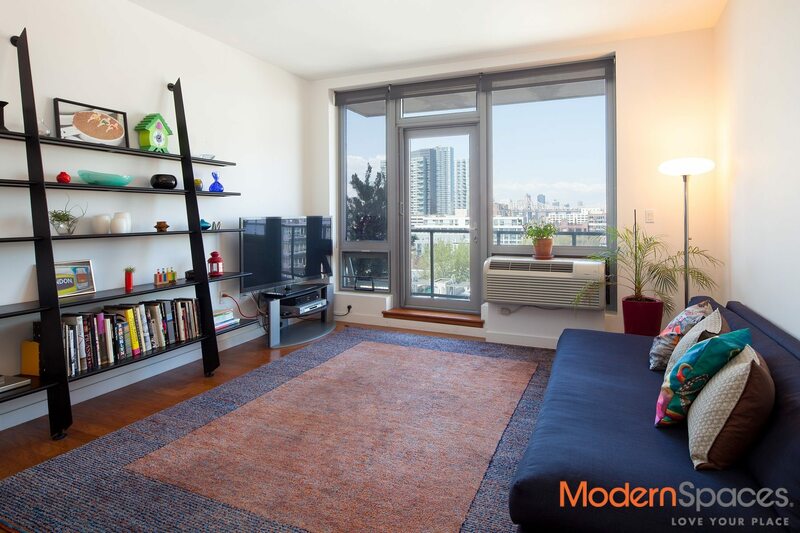 If open, unobstructed views from every room is top on your wish list for a perfect home, then this delightful 2BR/2BA apartment will fulfill all your visual expectations. 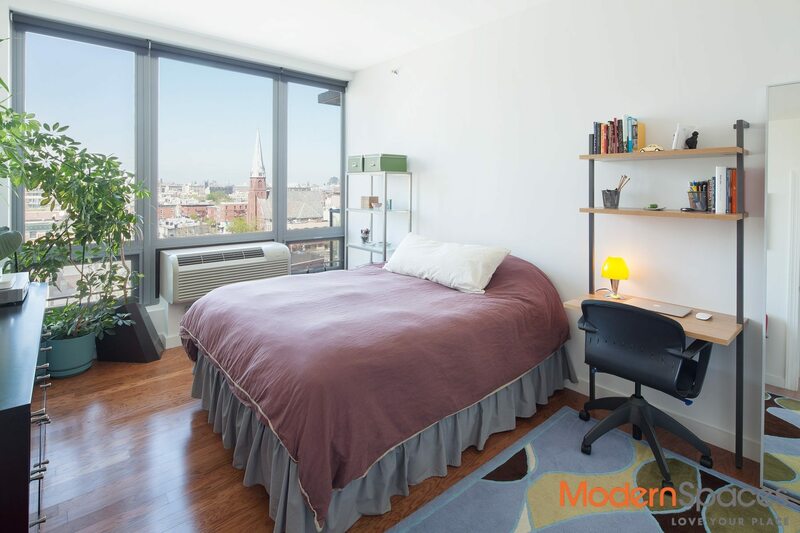 Filled with natural light streaming through its floor-to-ceiling windows that look onto the surrounding rooftops, the charming views of LIC’s neighborhood radiates throughout each spacious room. And Manhattan’s breathtaking skyline can equally be enjoyed from its generous sized balcony accessible from the living room. This apt not only has incredible vistas of the exterior, the interior offers sleek styling and a superb flow. The gourmet kitchen features customized walnut cabinetry, granite counter tops and all high-end stainless appliances by Fisher & Paykel. Also included is a Bosch washer and dryer. 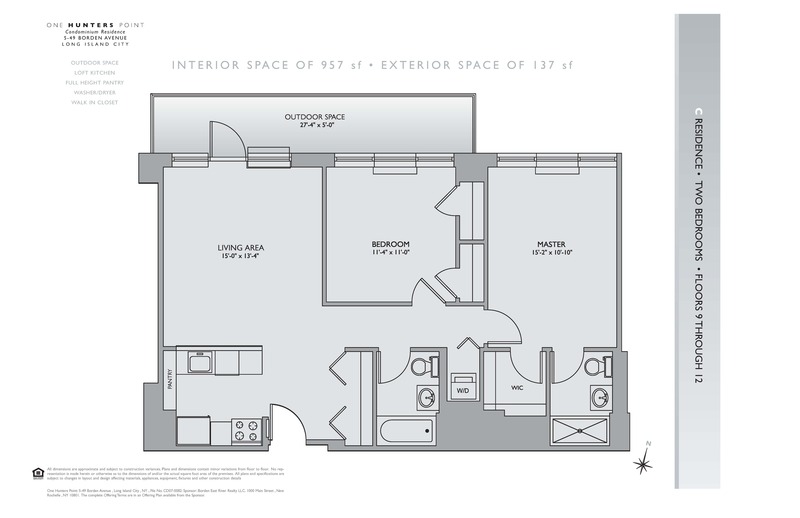 The large master bedroom has a sizable walk-in closet and a spa-like en-suite bathroom. The second bedroom also has ample space with a double sized closet. Hardwood floors throughout. Customized linen and storage closets. New energy efficient heat and A/C units have been installed as an upgrade and to add quiet comfort. One Hunters Point condominium is a 12-story glass building that includes a residents’ lounge, 24-hour doorman, fitness center, and an outdoor grass courtyard equipped with barbecue grills, lounge chairs and stone built tables with seating. Situated in Long Island City’s Hunters Point section, one block from the 4 minute train ride to Grand Central and a short block to LIC’s waterfront promenade. Also steps away from the popular Vernon Boulevard offering shopping, restaurants and nightlife. 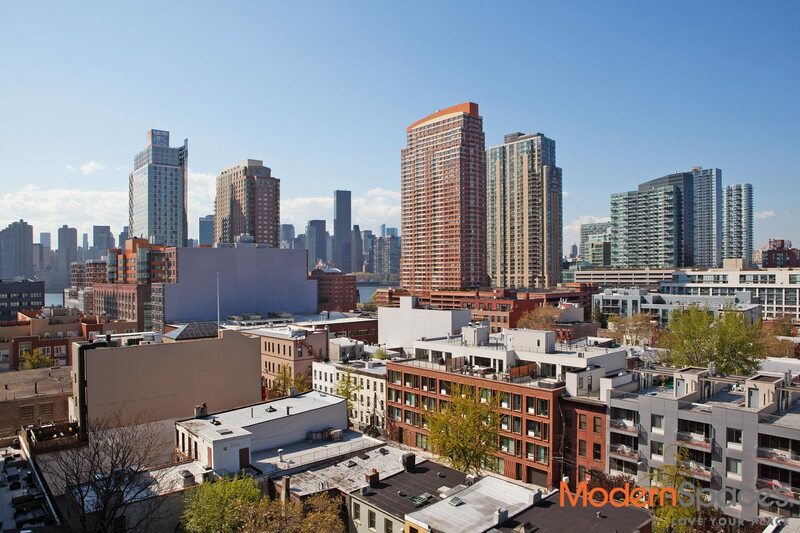 If open, unobstructed views from every room is top on your wish list for a perfect home, then this delightful 2BR/2BA apartment will fulfill all your visual expectations. 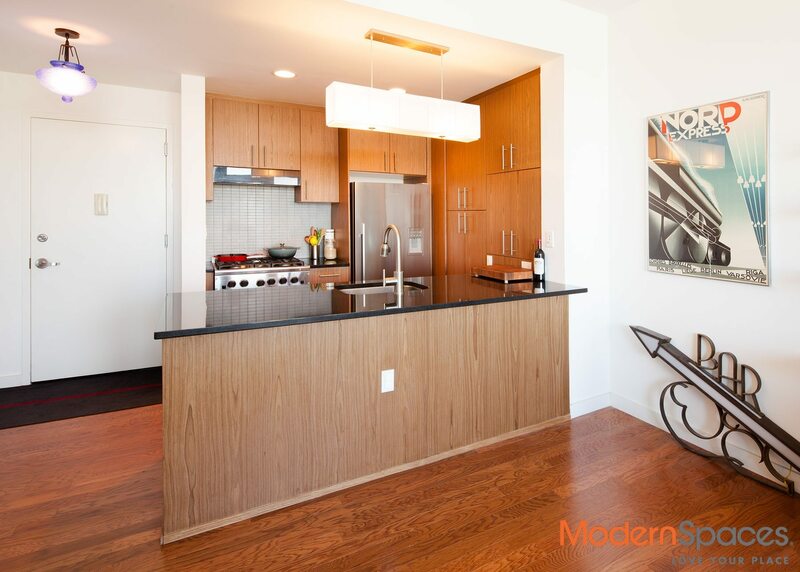 Filled with natural light streaming through its floor-to-ceiling windows that look onto the surrounding rooftops, the charming views of LIC's neighborhood radiates throughout each spacious room. And Manhattan's breathtaking skyline can equally be enjoyed from its generous sized balcony accessible from the living room. This apt not only has incredible vistas of the exterior, the interior offers sleek styling and a superb flow. The gourmet kitchen features customized walnut cabinetry, granite counter tops and all high-end stainless appliances by Fisher &amp; Paykel. Also included is a Bosch washer and dryer. 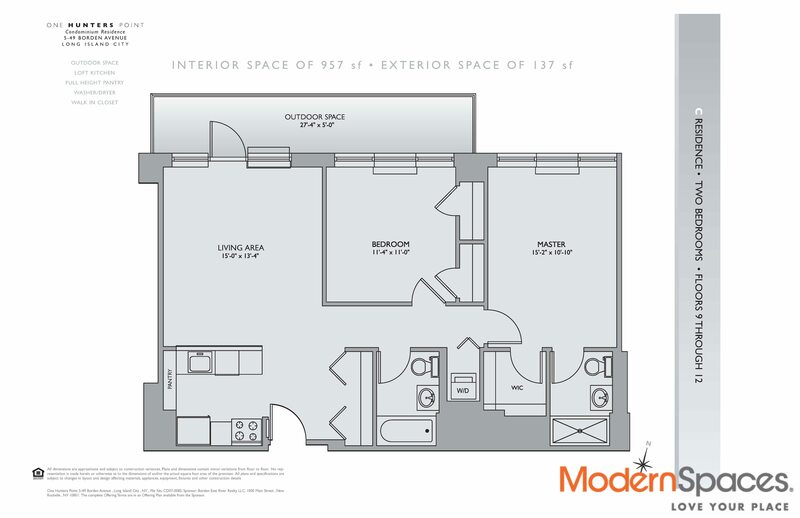 The large master bedroom has a sizable walk-in closet and a spa-like en-suite bathroom. The second bedroom also has ample space with a double sized closet. Hardwood floors throughout. Customized linen and storage closets. New energy efficient heat and A/C units have been installed as an upgrade and to add quiet comfort. 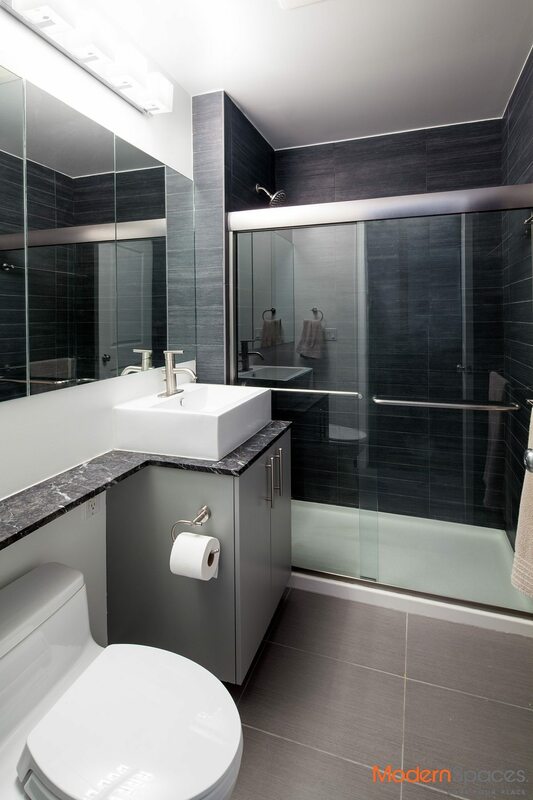 One Hunters Point condominium is a 12-story glass building that includes a residents' lounge, 24-hour doorman, fitness center, and an outdoor grass courtyard equipped with barbecue grills, lounge chairs and stone built tables with seating. 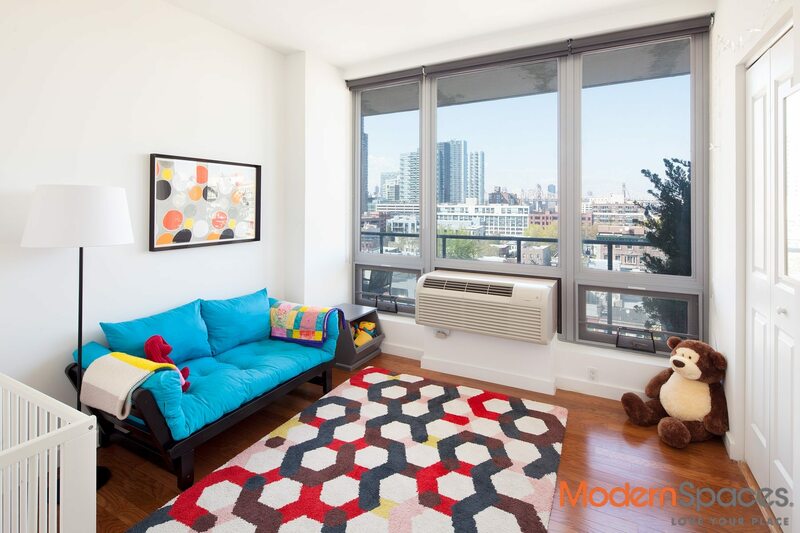 Situated in Long Island City's Hunters Point section, one block from the 4 minute train ride to Grand Central and a short block to LIC's waterfront promenade. Also steps away from the popular Vernon Boulevard offering shopping, restaurants and nightlife.